David & Jim | Giving Back ";s:21:"divi_integration_body";s:415:"
Meet David and his Dog Guide Jim, from Calgary, AB. David and Jim (nicknamed Jimmy) graduated from the Service program through Lions Foundation of Canada Dog Guides. 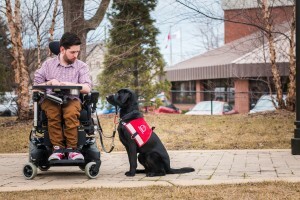 Because of your continued support we are able to provide Canadians, like David, with Dog Guides at no charge to them. We spoke with David to learn more about his life with Jim. My name is David. My friends would describe me as funny, loyal, and compassionate. I am an avid hockey and music fan and I can often be found at Flames games and concerts with my service dog, Jim (Jimmy), by my side. I have a background in Public Relations and work in a research centre at the Alberta Children’s Hospital. How long have you been involved with Lions Foundation of Canada Dog Guides? I have been involved with the Lion’s Foundation of Canada Dog Guides for twelve years. My previous service dog, Oswald, was with me for eleven years, and Jim has been supporting me since February 2016. How did you find out about them and their services? I have always been an advocate for independence and was searching for a way to achieve that in my own life. After graduating High School and entering University, I was referred to the Lion’s Foundation as a way to further my independence during this next chapter of my life. What does it mean to you to have a Dog Guide for support? It means everything, he not only provides me with the ability to complete essential tasks of daily living, he also provides me with a loving companion. In the four short months that we have been a team, we have formed an incredible bond based on mutual care and respect. I truly believe just as much as Jim is here to serve me, it is equally my responsibility to serve and love Jim. How does Jim help you in your daily life? What are you able to do/participate in now that you have his support? Jim’s skills allow me to complete tasks that I otherwise would be unable to due to limited mobility. Jim can push buttons to open automatic doors, fetch items from the ground, bring items to others, and alert others in emergency situations. What’s the one thing you would say to encourage people to donate money in support? I often refer to Jim as my four-legged hero. Without the ongoing financial support and awareness from the community, these four-legged heroes would not exist. Jim provides me with a level of independence and security which would be impossible without these generous donations. Tell me about Jim. What’s he like and how does he fit into your life? Jim definitely fits the description of a working dog. He is vigilant, eager, and incredibly intuitive to my needs. Jim has a laid back personality and a big heart. He is always there to lend a paw.